Facebook created a VR selfie stick because why ever leave home, right? If Facebook has its way, VR will be a lot more social. So much so that you’ll even be able to take selfies in virtual reality at places you’ve probably never even been to. At its F8 event today, Facebook took time to discuss just how Oculus would be able to let friends meet up virtually, then visit a completely different location for a kind of Total Recall vacation. It’s a technical slight of hand that involves VR, 360-degree video and two Oculus headsets. As you can imagine, it’s far from actual reality at this point; not only is 360-degree video not very popular yet, but Oculus is just now finding its way to the world. But in Facebook’s world, VR is a totally normal thing that we should all be doing regularly someday. 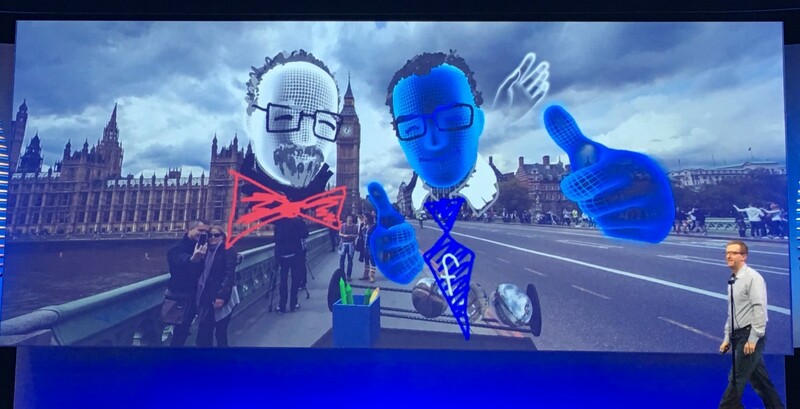 On stage, two VR pals visited London and took a virtual selfie of their avatars, and posted the resulting image to Facebook. They even drew ties for each other in VR — a kind of ‘costuming’ effect you’ve probably seen in real life at photo booths. While it’s totally weird and honestly kind of stupid, the VR selfie is a cool illustration of how social VR can be (potentially; this is still a project inside of Facebook, not a product ready to ship). Sadly, it only uses avatars, so it’s not quite as good as an actual selfie. And that’s okay, because we still need to get outside and do things. Like travel to London in real life — and take a selfie. Jaivik Shah is Editor At Large of TechOptimals, He writes about how technology is changing the way we live and work in the 21st century. © 2017 TechOptimals Inc. All rights reserved.